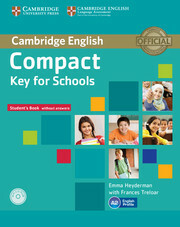 Compact Key for Schools is a focused, 50 - 60 hour course for the Cambridge English: Key (KET) for Schools exam. 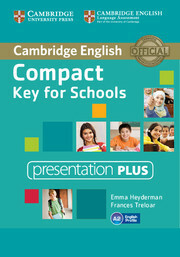 Compact Key for Schools Presentation Plus allows you to present and interact directly with the Student's Book, Workbook and Class Audio at the front of the classroom. With Presentation Plus you can highlight, write and erase; hide and reveal text and images; zoom in and out; create notes and save annotations; attach your own web links; display answer keys; play all Class Audio and display the listening scripts; and connect to Cambridge Dictionaries Online via the internet. Presentation Plus can be used with all types of interactive whiteboards or with a computer and projector.